I’d had every intention of starting Camp Nanowrimo by now, but events have conspired to keep me from even starting to think about my next project. 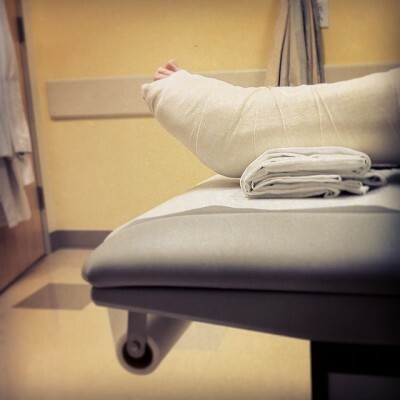 Last Wednesday, my mother broke—nay, shattered—her ankle while walking on the beach. She is currently recovering from her first surgery and waiting for the second. The first surgery screwed a metal cage onto her leg and foot to hold everything in place. The second will bolt metal plates to her bone, making her a cyborg. This means that I’ve spent most of the last week driving back and forth between Providence and Boston, leading me to wonder why anyone would ever willingly commute to Boston. Originally I was going to start off Camp Nanowrimo with a bang, making a second attempt at Nanowriday, which I tried and failed at last year. I just want to beat my wordcount from last time. But in order to do that, I have to have a vague idea about what to write. This is always the most fun part of writing—the part when the possibilities are endless. I move back in with my parents on Friday, and hopefully I can steal away from my nursing duties for 24 hours to make a valiant effort at writing 50k words. Or, at the very least, more than 10k. In other news, I took advantage of the Steam summer sales and picked up a few games for my future procrastination. Tomb Raider, Borderlands 2, The Stanley Parable, The Wolf Among Us, and Civ V: Brave New World. That should help with that whole Camp Nanowrimo thing. Oh! And before I forget: my fiendish critiquer William has started an epistolary book rec blog at Hey Ashers! If you like YA novels, especially spec fic with queer themes, you might be interested in what Will has to recommend. So now I’ll get back to melting in the heat and thinking about my next project. I hope it’s not supposed to be this hot the rest of the week, especially on Friday, which is my moving out day. Let’s see what Weather.gov has to say about the forecast.